Craft projects for dish towels are a wonderful way to recycle those old, worn out kitchen towels. From valances to room accessories, there is a project to fit everyone's needs. If you like a country or a cottage look, there are many accessories that you can create with your worn kitchen linens. Not only does it add charm to your home, but using the towels for crafts keeps them out of the garbage dump. This adorable scarecrow is perfect to perch on a windowsill or bookshelf. He is quick and easy to make and would be a big hit at a church bazaar or craft fair. Cute, embellished dish towels are quick and easy to do. Dish towels with crocheted tops make great gifts for a housewarming or any other occasion. Still don't have any reusable grocery bags? You can still do the right thing and use the plastic bags over again. Make a dish towel shopping bag holder to keep the bags accessible. 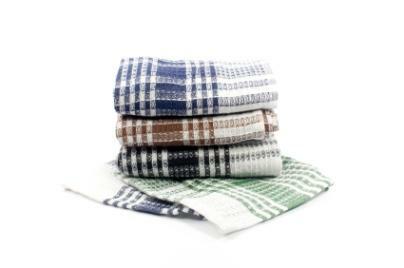 If you have a vintage dish towel, try this dish towel quilt from Bernina. This easy mini quilt features a great retro look. Give someone special this dish towel angel complete with a poem. Reusable shopping bags made from dish towels are not only good for the environment, they are fun to make. This country craft project for dish towels makes a perfect gift or decoration. Place this doll on a shelf or in a rocking chair for a cute welcome home. There never seem to be enough hot pads in the kitchen. Have plenty on hand and recycle old dish towels as well. Keep dust and dirt off of your sewing machine with this dish towel sewing machine cover. Dish towels make great flatware and dish holders for picnics. Make a tea cozy and matching trivets for yourself or to give as gifts. Kids will need help with these projects, but they are a great way to build relationship. For a great Mother's Day or Father's Day gift, have children create these handprint towels and potholder sets. Baby bibs are a quick project for almost anyone. Old, worn out towels work well to make baby bibs even if they have holes or tears. If you have a small helper in the kitchen, use a dish towel to make this child's apron. If you don't happen to have vintage dish towels lying around, you can still find them to do a project with. Since you are generally buying a used product, be sure to read the descriptions carefully and make note of any references to wear and tear. Vintage dish towels are almost always available on eBay. Sharon's Antiques and Vintage Fabrics has some beautiful antique kitchen linens. Tias also has antique towels. If you like a retro look, then antique dish towels are a great way to achieve your decorating dreams.